We’re finally starting to see full tablet support on an abundance of apps these days, and Taptu is one of them. 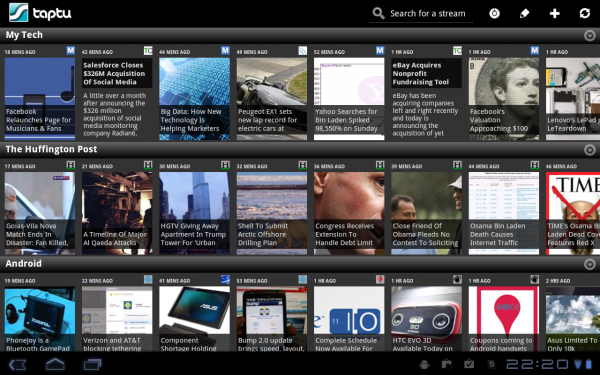 Rebuilt from the ground up with Honeycomb in mind, this is picture-styled news reader which will remind you of Pulse, except that it has unique features like the ability to import up to 100 feeds from your Google Reader account. They also tossed in the ability to add multiple Twitter accounts, which is something the iOS version can’t even accomplish. Themes: Change the color theme from dark text on a white background to white text on a background for better reading day or night. Full screen reading: Read articles in fullscreen instead of a tabbed look. Instapaper support: Don’t have time to read it now? Send it to your Instapaper account to read it later. What are you guys using on your tablets? Google Reader, Pulse, or Taptu?